The Washington Nationals have parted ways with manager Dusty Baker. 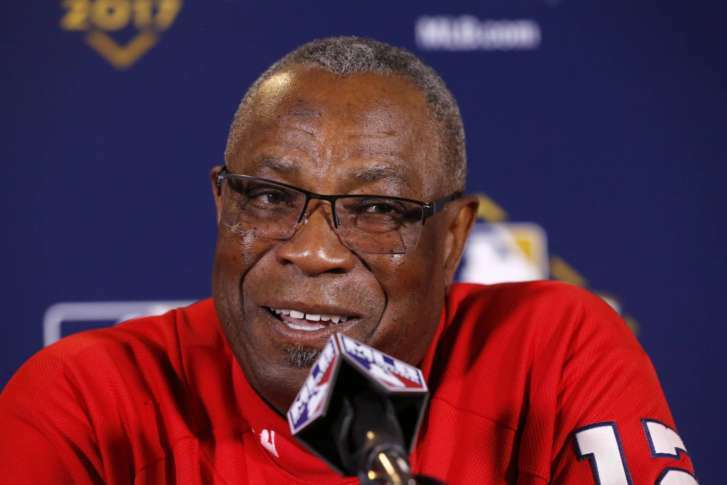 WASHINGTON – The Washington Nationals will not retain manager Dusty Baker after two years with the team. Baker had finished the second of a two-year contract with the Nationals and will not be re-signed, the team said in a statement Friday. In a conference call Friday afternoon, Nationals General Manager Mike Rizzo called Baker “a Hall of Fame-type manager,” but that the expectations of the team had grown along with their success. Baker’s record with the Nationals was 192-132; his postseason record was 4-6. The team lost in the National League Division Series last week for the second year in a row. Both times they lost the decisive Game 5 at home. Rizzo wouldn’t explain, when asked directly, what it was about Baker that made him an unsuitable choice to take the team to the next level, but said contract negotiations with Baker were not a factor. “This was a pure baseball decision,” he said. Rizzo said he and the ownership group made the decision Thursday night — “one of the most difficult decisions that the ownership group and myself have had to make” — and Baker was informed Friday morning. “He took the news with his usual class and dignity and professionalism, and we hung up the phone with a good taste in both of our mouths,” Rizzo said. The team also said that the coaching staff will not be retained. The search for a new manager will begin immediately, and the new manager will pick the coaching staff, the team said. Baker finished second in National League Manager of the Year voting in 2016; he won the title in 1993, 1997 and 2000, all with the San Francisco Giants. He has also managed the Chicago Cubs and Cincinnati Reds. He also played from 1968 to 1986 with the Atlanta Braves, Los Angeles Dodgers, San Francisco Giants and Oakland A’s.